Is there anything more heavenly than a madeleine delivered fresh from the oven? This little cookie inspired Marcel Proust to recount lost memories. Could the meaning of life be nested in this little cookie? The first time I tasted a madeleine was at restaurant Daniel–in its original Venetician-inspired encarnation. The pastry chef sent out a clutch of madeleines wrapped in white linen like a new born. The cookies were still warm and smelled of sunshine and promises. I will never forget my first bite. It was like biting into a little cloud and tasting of heaven, if heaven exists then I am a devout believer. Put up a pot of tea and prepare to be transported back in time. This recipe makes a rather moist cookie–dunking is optional. I’ve tried many recipes and this one is by far my favorite. I nudged the amount of salt and sugar but you could do with less (1/8 tsp salt, 2/3 cup sugar) as per the Joy of Baking recipe. Baker’s note: the key to a successful madeleine is the “buerre noisette” (brown butter) which gives the cookie its nutty flavor, so don’t skip this step. Melt 1 stick of butter in a small sauce pan over medium heat until the butter is browned but careful not to let it burn. Remove from heat and set aside. Sift flour, baking powder and salt in a small bowl and set aside. In an electric mixer on medium-high sppeed, beat eggs and sugar until the mixture doubles in volume and forms thick pale yellow ribbons. Sift the flour into the egg mixture in three batches. Use a large rubber spatula to fold the flour into the eggs. Fold in the melted butter. Cover with plastic wrap and refrigerate for at least 30 minutes. Meanwhile, position rack into the center of the oven and preheat to 375 degrees. Using a pastry brush or your fingers, generously butter the madeliene molds. Drop a tablespoon full of butter into each mold. Bake 11-13 minutes, or until the edges are slightly golden brown and the centers bounce back to the touch. 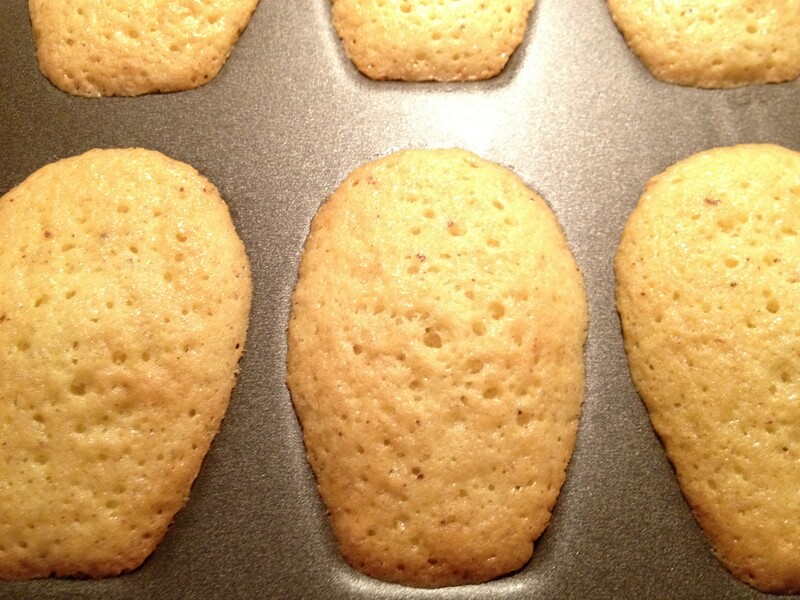 If you make miniature madeleines, reduce the baking time to about 7-9 minutes. 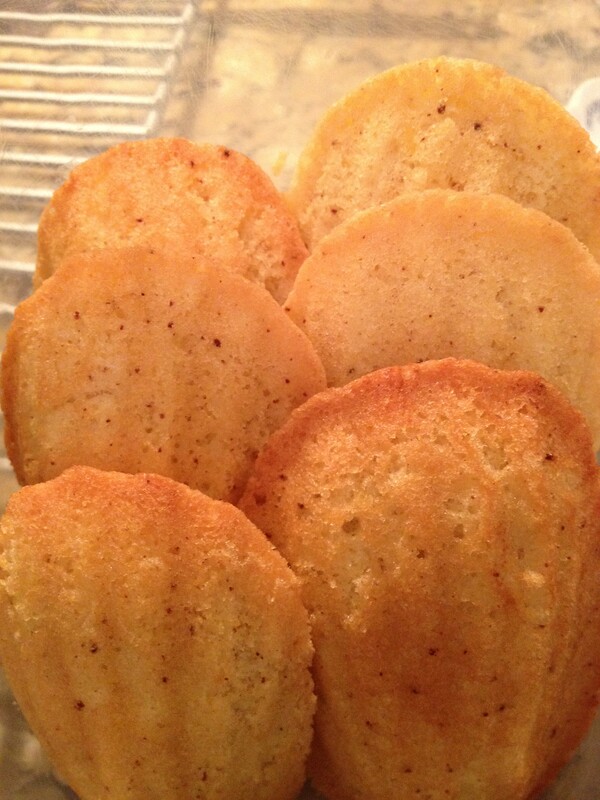 Remove pans from the oven and gently tap out the madeleines and let cool on a wire rack, smooth side down. i love these! my favorite!! Thanks for visiting, Ashley. Do you remember your first bite of Madeleine?